Covered cat litter boxes are better than open ones. I thank that is obvious if the added expense is not an issue. They are not that much more expensive, though. From my point of view a litter box that is covered is very suitable in a small living area such as an apartment. The advantages are that they keep smells down as they often have a filtered enclosure and a cat flap for access. They also stop litter being kicked out of the box. Although, some litter will invariably be “walked out” between the toes of the cat! Another point is that they seem to be larger, in general, than the standard cat litter box. This may be because there has to be sufficient space for a cat to turn around in with walls on all four sides. What do the experts say about covered cat litter boxes? 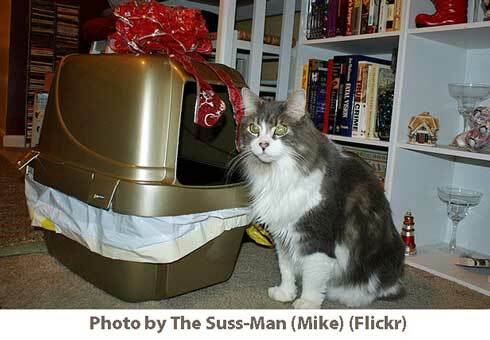 Well HSUS says that a covered cat litter box may not be large enough. I agree but for the reasons above, I think that it will be, except for the largest of cats. There is an optimum size by the way – How big should my cat’s litter box be?. HSUS also says that we are more inclined to ignore and clean a covered box because the odours are kept in and it is out of sight – fair point. It just takes a bit of discipline from us. Twice a day is usually more than enough. One small downside that comes to mind is that some cats might simply not get on with a litter box being covered. The cat has to go into a small space through a door and a timid cat might not like it but all cats are individuals and once used it will become familiar to the cat as it will have its smell on it. This is comforting – see cats sleeping in litter box. With that simple résumé in mind, below is a carousel of covered cat litter boxes from Amazon.com (North American market). As there is a large range, I have selected those that achieved at least a review and therefore a star rating. The selection is taken from the first listed by Amazon as the carousel only allows for ten items. The only one to get 5 stars was the “TIDY CATS Litter BOX” but only 8 people reviewed it. The biggest seller by far is the automatic one called the “Omega Paw Self-Cleaning Litter Box”. I have done a review on automatic litter boxes. My personal advice in buying these sorts of products is to go for simplicity as it equates to reliability and usability. This Amazon widget no longer works – Very Sorry – damn Amazon – never use their bloody widgets….. Here is the selection in words (as at Nov. 24th 2010). Things change, of course. From Covered Cat Litter Boxes to Domestic Cat Breeds. This entry was posted in Cat Products and tagged cat litter, cat litter tray, covered cat litter boxes by Michael Broad. Bookmark the permalink.